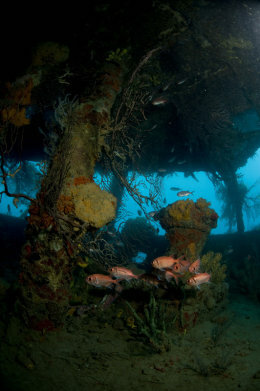 Wreck photography is a fascinating aspect of underwater imaging. Man made objects under the water make evocative subjects with which people naturally connect. Sunken ships, submarines and aircraft often have engaging backstories or are shrouded in mystery. Unsurprisingly many divers want to explore wrecks with camera in hand. Photographing wrecks creates a number of challenges, which we rely on specific camera features and accessories to overcome. Even a small cabin cruiser is actually quite a large subject to photograph underwater. The problem is our limited visibility through water. Our cameras struggle to take sharp pictures much past 1/4 of the distance we can see with our own eyes. So in a tropical location with 30 metre viz, you need to be no more than 7 to 8 metres away from your subject to take a clean, sharp photograph. Often visibility will be much poorer and our wreck much larger. The lenses built into compact cameras or kit lenses supplied with many compact system cameras or SLR’s usually have a very modest angle of view. They struggle to take pictures of large subjects, like wrecks, from near distances. Pictures taken with these lenses of wrecks usually lack detail. Successful wreck photographers almost always rely on fisheye lenses. Fisheye lenses are ultra wide angle lenses that allow you to move in really close to your subject, even when that subject is large. Not all cameras and housings accept fisheye lenses. There’s also confusion between what are true fisheye lenses and what are either ordinary wide angle lenses or simple dome ports. Ordinary wide angle lenses tend to see about half as much of the scene as fisheye lenses. Dome ports are ‘restorative’. Like your eyes behind your facemask, a lens used behind a flat camera housing port will be refracted and its angle of view will be greatly reduced. A dome port prevents this and the angle of the lens remains roughly the same underwater as in air. Owners of CSC or SLR cameras using a fisheye lens inside their housing would use a dome port. For compact camera users the situation is more complicated and it is a good idea to check the latest information on camera, housing and fisheye lens compatibility with your official INON UK specialist dealer. No digital compact camera has a built in fisheye lens, so one has to be added. Many compact cameras and housings cannot accept fisheye lenses and will produce disappointing pictures when used for wreck photography. INON makes a series of mounts to ensure optimum optical quality when their lenses are used on your compact or specific CSC bodies. Current INON wide angle lenses are designed to convert into fisheye lenses. This is a very smart concept. All INON UWL100 wide angle lenses can be equipped with an optically matched INON Dome Lens Unit, which increases the UWL100 lenses field of view by around 50 percent. Not all divers will need a lens as extreme as a fisheye and a normal INON UWL100 wide angle lens will be perfect for photographing mantas or basking sharks for instance. If they then find they do need to go wider because, for example, they have become interested in wreck diving, they can affordably add the INON Dome Lens Unit. Fisheye lenses don’t just let you take good pictures outside wrecks. They are essential for taking pictures inside confined spaces like cabins, engine rooms and bridges. Fisheye lenses are also popular choices for low visibility photography and for creative close focus, wide angle photography. 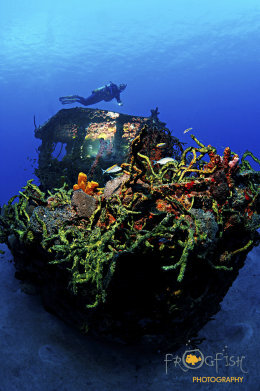 Wrecks are often located in deeper water, so light levels can be quite low even at noon. Breaks in the hull and light streaming through open hatches and portholes mean divers are often drawn to shoot in areas with complicated lighting. Useful camera features to counter this include low noise sensors so you can use high ISO’s in poor light and high dynamic range to help prevent burn out from high lights while still retaining detail in the shadows. The size of wrecks makes them difficult to light with flash. Underwater flash units or strobes only return vivid colours from a maximum distance of around 1.5 to 2 metres. Video lights usually have far less range. Flash is only normally used to light up small areas inside wrecks or to add colour to the foreground. The foreground might be part of the wreck itself, or a subject like a diver or coral in front of it. Multiple flashguns are sometimes used to creatively light a wreck and INON UK’s Level Two Lighting Course discusses this. 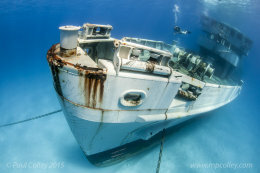 To keep colour and contrast in your wreck pictures, using manual white balance or MWB and a Magic Filter works well. There will a be a limit on how deep you can use MWB depending on the camera and water conditions, but used properly MWB yields good colours and contrast over long distances. 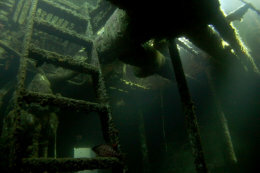 Wreck divers may need to invest in deeper rated housings than those provided by camera manufacturers. They may also want to consider how easy the housings controls are to operate when using gloves. Many INON UK dealers have enthusiastic wreck photographers on their staff and can offer sound advice based on real experience. 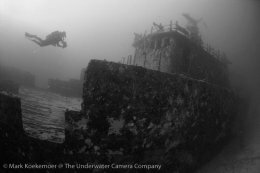 INON UK is developing the INON UK Level Three Wreck Photography Course to be taught by INON UK accredited underwater photography instructors. INON UK instructor - trainer Steve Warren used a tripod for this long exposure inside the engine room of a small barge. Olympus XZ-2 with INON UWL - H100 wide angle lens. In the dark, Steve did not even notice the fish resting on the ladder. Steve chose this wreck for night filming for Channel Five's TV show Gibraltar - Britain in the Sun. This image was taken in one of the best wreck destinations, and little known, island of St Eustatius in the Caribbean by Nick Robertson Brown of Frogfish Photography. "To take this shot, I asked Caroline to go inside the wreck (if you look closely you can see her inside the wheelhouse) where she put her own camera which had 2 INON Z-240 strobes attached, set to fire as slaves, and also another 2 D2000 strobes positioned around the wheelhouse. This was done to light up the lovely orange and pink corals on the roof. My 2 INON Z-240 strobes were mounted on my camera to light the bow of the wreck which is covered in sponges and these also fired the slaves in the wheelhouse that Caroline had setup. I ask our dive guide to model by hovering above the wreck. I wanted to shoot the wreck like this, so that you can also see the surface, which gives the viewer a real feel for what it is like to dive this tug boat. Lots of colour, clear blue water, great dive!" 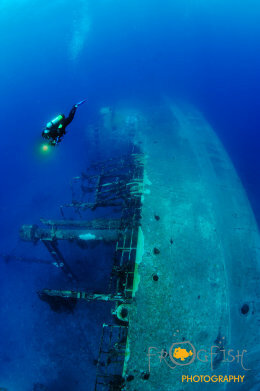 "The photographic intent in this image was to show the scale of the wreck by including a diver and choosing a viewpoint that emphasised depth perspective. I also wanted to achieve good colour penetration throughout the image by using natural light and a red filter. Nikon D300 and Tokina 10-17mm lens at 10mm in a Subal housing", says INON UK Underwater Photography Instructor and Expert, Paul Colley CB OBE. Lisa Collins wanted to capture the prolific growth of corals and marine life within the Lesleen M Wreck of Anse Cochon Bay in St. Lucia. It was difficult to balance the light within the wreck with than streaming through the windows from the open ocean. By using a fast shutter speed and high f stop, Lisa used her strobe to light the foreground without blowing out the background. Always use a fish eye lens when shooting wrecks, I positioned myself between the ships gate and the diver to get the most out of the negative space to balance out the composition with the rest of the wreck. The diver also helps to give a sense of scale. Turning wreck photos into black & white is also a nice touch. Choosing recognisable features of shipwrecks helps audiences orientate themselves to the picture. INON UK underwater photography course instructor Sam Read selected the propeller of the Salem Express ferry and posed INON UK’s co –owner Steve Warren alongside to add scale and human interest. Originally shot in colour, Sam turned the image to monochrome. Black and white often works well on shipwrecks, which may otherwise reproduce with a dull monochromatic blue or green colour cast. Black and white shifts the impact of the image to tonal range instead of colour and can add drama and emotion.